Last Thanksgiving, my wife was all braced-up to cook turkey, stuffing and cranberry sauce. I also wanted to contribute a little. So I opened Nobu the Cookbook, and found the slow dried fruit tomatoes recipe. I knew they grow fruit tomatoes in Japan, but I could not find equivalent in U.S, so I just bought golf ball size tomatoes that looked fully ripe instead. I dropped the tomatoes in boiling water for a second after making very shallow cross incision at the bottom so I can peel the skin easily. The tomatoes are roasted for 3 hours in low heat oven bottom side down. 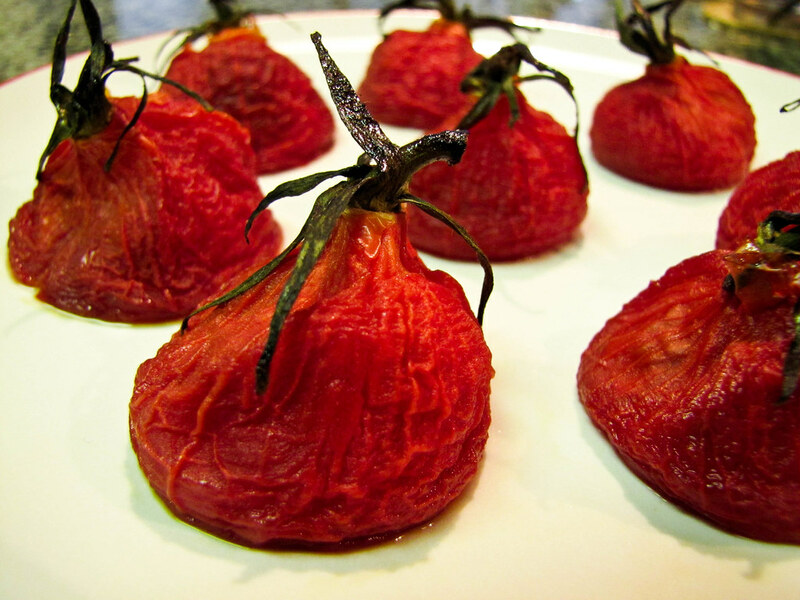 After roasting, move the tomatoes to room temperature where it is well ventilated, and dry for 6 hours.